Bradford on Avon’s OJO Solutions has donated £15,000 of studio time to develop a new mobile game in support of Wiltshire Air Ambulance. The game, called Helifun, challenges players to keep their helicopter up in the air as long as possible, avoiding obstacles along the way. The team at OJO Solutions hope that the game will help the charity to raise the £3.75 million per year needed to keep the Wiltshire Air Ambulance flying and saving lives. Nathan Baranowski, Managing Director at OJO Solutions, said, “Wiltshire Air Ambulance is seeking to engage new and existing supporters in a different way, as well as to appeal to a younger demographic. “Helifun is a simple but fun game which brings the work of paramedics, pilots and fundraising staff to life. This is a great example of how digital technology allows you to think outside the box, to change what you do and how you do it. The company is also a member of the charity’s business networking group, The 100 Club, where businesses pledge to give £10,000 over a two-year period through fundraising, as well as pro-bono work. In addition, Nathan Baranowski also ran the Bath Half Marathon in support of the charity and is due to tackle the Race to the Stones in July, a two-day 100km ultra-marathon across the North Wessex Downs. 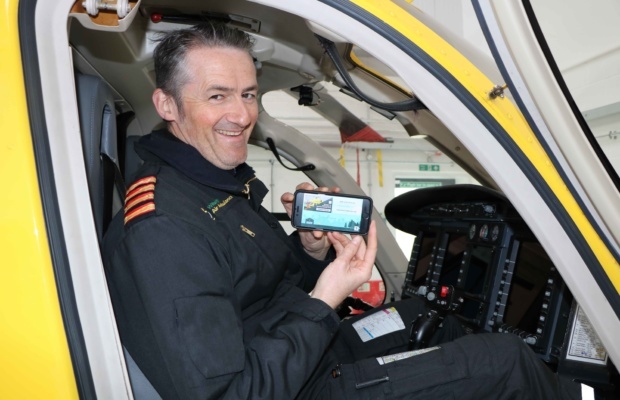 Adam Baker, Communications Manager at Wiltshire Air Ambulance, said, “Helifun is a great way for us to interact with people of all ages, as we look to use gamification to raise awareness of the importance of Wiltshire Air Ambulance to the county. Helifun is available to play on the Wiltshire Air Ambulance website and to download on Apple and Android devices. To view the game visit the Wiltshire Air Ambulance website. Pictured: Wiltshire Air Ambulance pilot Elvis Costello playing the game in one of the charity’s helicopters.